Mike Cluck stands with his wife, Nancy, in the front hallway of their home in Edwardsville. An estimated 20 million people have health insurance through the Affordable Care Act, but dissatisfaction with the law helped propel Donald Trump the presidency. One criticism is a lack of choice for insurance plans bought on Healthcare.gov, an online marketplace established for uninsured individuals to shop for coverage. In three Illinois counties east of St. Louis, residents have just one insurance provider to choose from on the exchange for 2017, and enrollees say the coverage appears to have some serious gaps. Before the election cast doubt over the future of these plans and the federal subsidies that make them affordable, Michael Cluck's biggest concern was a narrow network of providers. Cluck, 62, and his wife, Nancy, 58, live in a quiet subdivision in Edwardsville. Cluck sells casualty and life insurance, but because he’s self-employed he's has always had to purchase health coverage on his own. When his private plan ended in 2015, they decided to look for coverage through the Affordable Care Act. “[It] actually saved us $300 a month, and we were really happy with it,” Cluck said. But two providers, including his own insurer, Coventry, dropped out of the health insurance exchange in Madison County for 2017, leaving just one: Blue Cross Blue Shield of Illinois. Like most insurance providers, Blue Cross assigns “in network” and “out of network” doctors to each plan as a way to keep costs down. If you go to an “in network” doctor, the insurance provider covers most of the costs. If the doctor is “out of network,” the patient pays more. The list is published online for new enrollees to browse, and some do contain errors. “That’s where the problem came in. Because all of my cancer doctors, and Siteman Cancer Center, are in St. Louis, Missouri,” Cluck said. Cluck was diagnosed with prostate cancer last year, and this fall his doctor at Siteman finally ruled him cancer free. It takes him about 30 minutes to drive to oncology appointments. By using the network providers shown for a plan with Blue Cross, Cluck would have to drive farther to stay in network. When reached for comment, Blue Cross provided few details. "Blue Cross and Blue Shield of Illinois is proud to offer marketplace plans for individuals and families in every Illinois county in 2017," the company said in a statement. "We work with Illinois providers to keep premiums affordable, while still maintaining a comparatively robust selection of doctors and hospitals in the state." In an email, Jonathan Gold, U.S. Department of Health and Human Services press secretary, compared the limited choices available to consumers to those in individual plans before the Affordable Care Act. In 2016, 77 percent of U.S. adults with plans bought on the exchange were at least “somewhat satisfied” with their health insurance, according to a survey by the Commonwealth Fund. 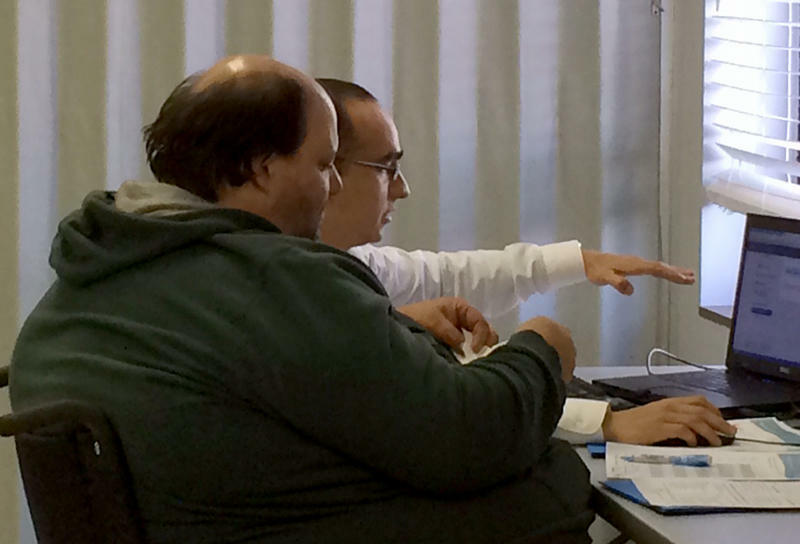 Gustavo Valdez, an insurance navigator with the Community Action Agency of St. Louis County helps Charles Niemeyer enroll in health insurance through the Healthcare.gov website. 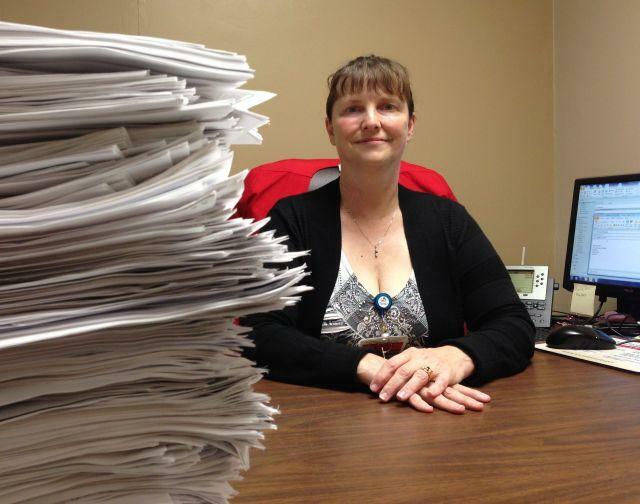 Tina Gallagher, an insurance broker who owns Gallagher Healthcare Solutions in Columbia, Illinois., said her clients in Madison, Monroe, and St. Clair counties are all left with just one insurance provider on the exchange this year. She said that Blue Cross is a good plan in many ways, but she warns customers about the limitations of the network. Despite repeated calls to company representatives, Gallagher said she has not received confirmation that her clients' care would be covered in St. Louis. Instead, the company pointed her to The BlueCard Program, which requires members to call a customer service number to request coverage in another plan's service area. To Cluck, it’s a frustrating display of flaws in the Affordable Care Act. On Nov. 8, when faced with a choice between Democratic presidential nominee Hillary Clinton and Donald Trump, he voted for the Republican. “For a lot of reasons, not just Obamacare,” he said. During his campaign, Trump repeatedly promised to repeal the Affordable Care Act, which established the exchange, expanded Medicaid in states that passed laws to do so, and required insurance companies to cover people with pre-existing conditions, like Cluck. Trump has expressed support for some elements of the law, such as covering people with pre-existing conditions and allowing young adults to stay on their parents’ insurance until the age of 26. Republican House Speaker Paul Ryan of Wisconsin has proposed his own healthcare proposal. In January, it’s unlikely Republicans would take the political risk of gutting the Affordable Care Act without a workable solution, said Wendy Netter Epstein, a health law expert at DePaul University. “It’s just simply not a possibility to go back to where we had over 20 million uninsured people who didn’t get access to good quality health care, who had to access health care through emergency rooms and drove up the cost of healthcare through the entire industry,” Epstein said. “So much time and effort and energy and resources was spent on Supreme Court litigation and defending the ACA, when those resources would have been better spent on trying to fix the problems that we were seeing,” Epstein said. Though Democrats in the Senate may block a direct repeal of the law with a filibuster, the Republican-controlled House and Senate could implement changes through budget reconciliation. As president, Trump will also have the power to drop the Obama administration’s legal appeal to a court decision that ruled against allowing federal subsidies on the health insurance exchanges, as Kaiser Health News reported last month. The eastern St. Louis metro area has been particularly hard hit by health insurance companies exiting the Affordable Care Act exchange. This week, the federal government released prices for 2017, which include substantial increases in western Illinois. Insurance brokers in Belleville say three Metro East counties — St. Clair, Madison and Monroe — will have just one insurer to choose from this year: Blue Cross Blue Shield.